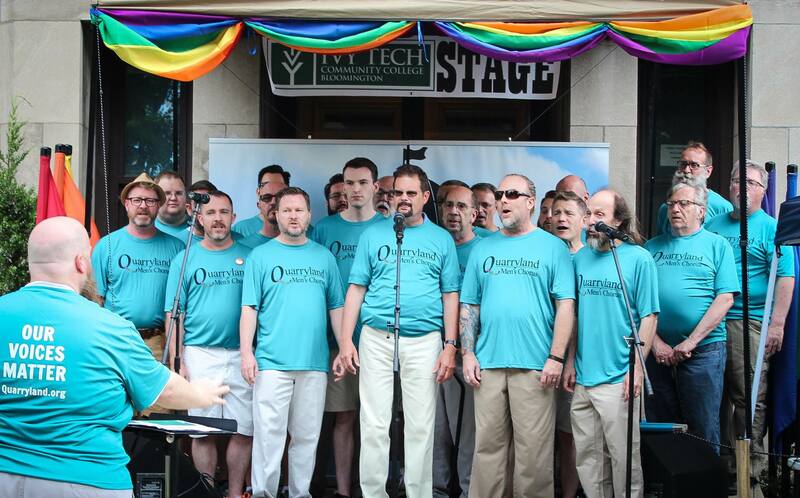 The 2016 Spencer Pride 10th Anniversary Festival was an amazing success by nearly all measures, despite a drizzly morning and a major downpour in the afternoon. An estimated 2000 people took part in the festivities of the 10th annual event in the heart of downtown Spencer. Especially notable was the continued and expanded presence of families. All ages took advantage of the inflatable fun that filled Market Street, from the Rock Climbing Wall, sponsored by the Dragonfly Gallery, to the Bounce House, sponsored by Edwards Farm Supply. 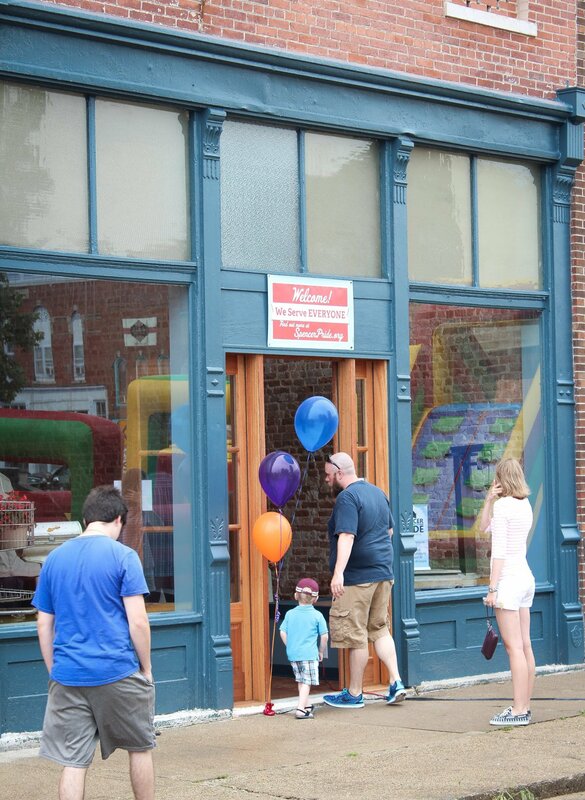 The Spencer Pride Festival continues to be the second-largest event taking place in downtown Spencer each year. There was an open house for Spencer Pride’s new CommUnity Center at 46 E. Market St, where the history of the past years of their efforts was on display. The facility also hosted a glass blowing demonstration by Family Dog Glass Shop and spirit tasting for those 18 and older by Cardinal Spirits. The building was popular throughout the day and even more so when the rain fell. “People were so excited to get a glimpse of our new CommUnity Center and to learn about what we will be offering there once we open in September,” said Spencer Pride Inc. president Jonathan Balash. 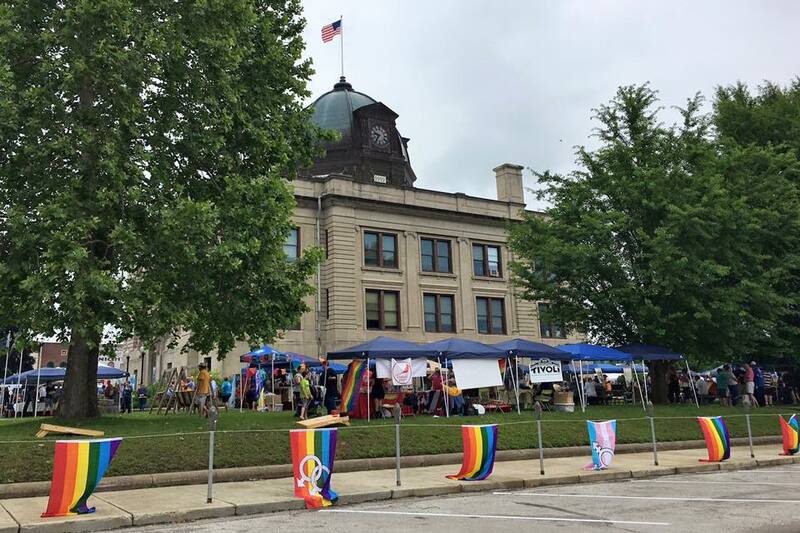 “They are amazed that Spencer, Indiana is about to become the smallest town in America with an LGBTQI community center, and they are expressing a strong desire to help make the facility a success,” Balash added. The festival was filled with plenty of activities for everyone; the entertainment on the main stage, the expansive marketplace, the tasty food options, the pet parade, and the Prism All-Ages Activity Zone. The special anniversary festival featured guest host, Suzanne Westenhoefer! She added a hilarious element to the already fabulous entertainment line-up. 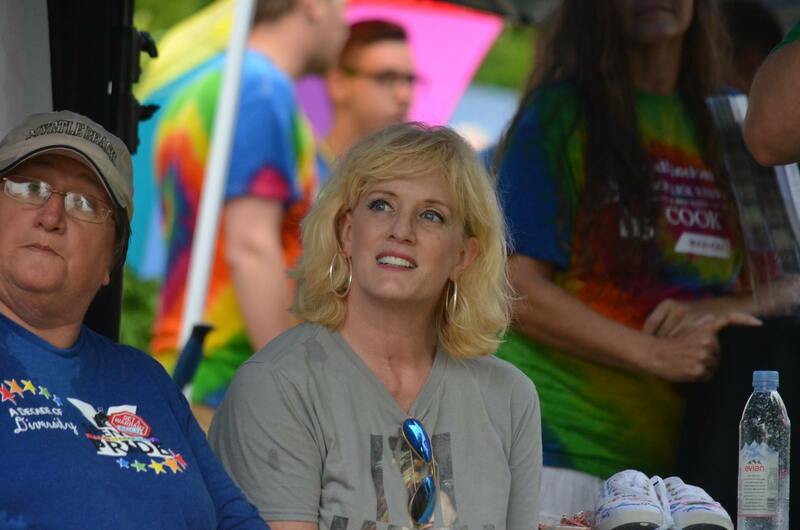 Sheryl Daniels returned for her fourth year as Emcee of the Spencer Pride Festival. Sheryl is also the entertainment coordinator of the event, so she is responsible for all of the talented artists who perform. A huge hit of the day was Bloomington Beat, a youth group who danced their hearts out! Also appearing were, SarahJayne Balash, Adam Riveiere, Hudsucker Posse, Andrea Davis, Window To My Soul, Quarryland Men’s Chorus, Different Drummer Belly Dancers, Ladies of Spencer Pride drag show and Rene Janski. They even had a Zumba session lead by Nancy Emerson. The entertainment was topped off at 7pm by King Bee and The Stingers. The food vendors were very busy, as usual. 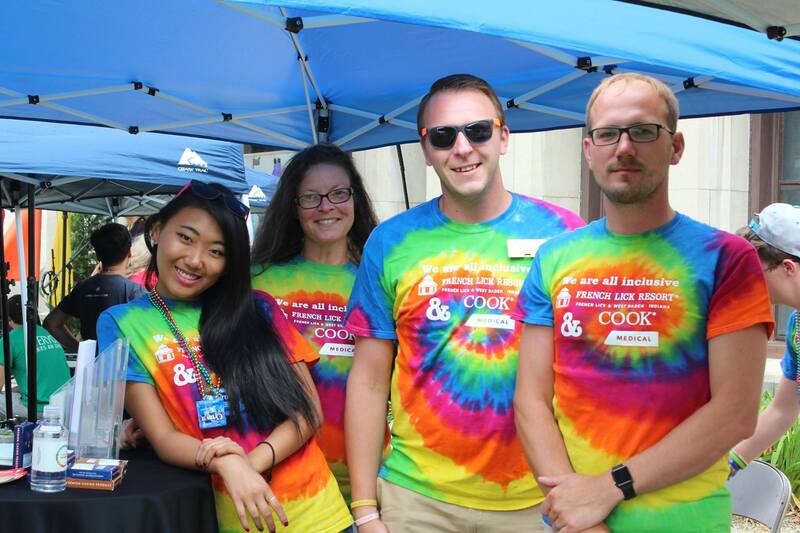 From funnel cakes to french fries, from ice cream sodas to cotton candy, from corn on the cob to buffalo burgers, and much more, there were plenty of options to satisfy most cravings at this year’s festival. The second annual pride Pet Parade was really popular! Nearly 20 animals participated in the parade. A panel of kids evaluated each one before announcing two winners – one GRAND PRIZE winner and one runner-up. All of the pets seemed to enjoy the attention they received as a result of their involvement in the event. The Prism All-Ages Activity Zone was entirely coordinated by Prism Youth Community-Bloomington and included a variety of activities for this year’s festival, including jewelry-making, button-making, sensory bottles, and more. This year’s 10th Anniversary raffle was filled with items like autographed items from renowned comedian Kate Clinton and the Indigo Girls, 2 overnight stays at French Lick, a hot air balloon ride for 2 from TJV Balloons, and many more items donated by celebrities and local businesses. 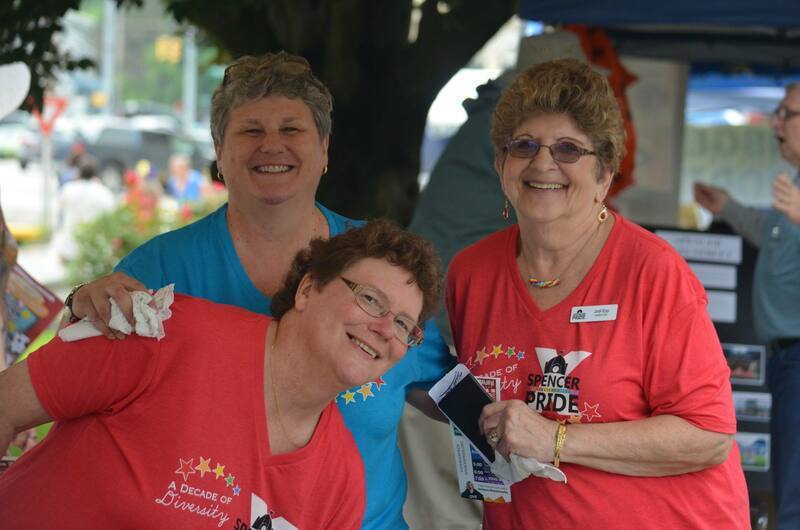 All of the volunteers at Spencer Pride Inc. were so pleased with how this year’s festival turned out. 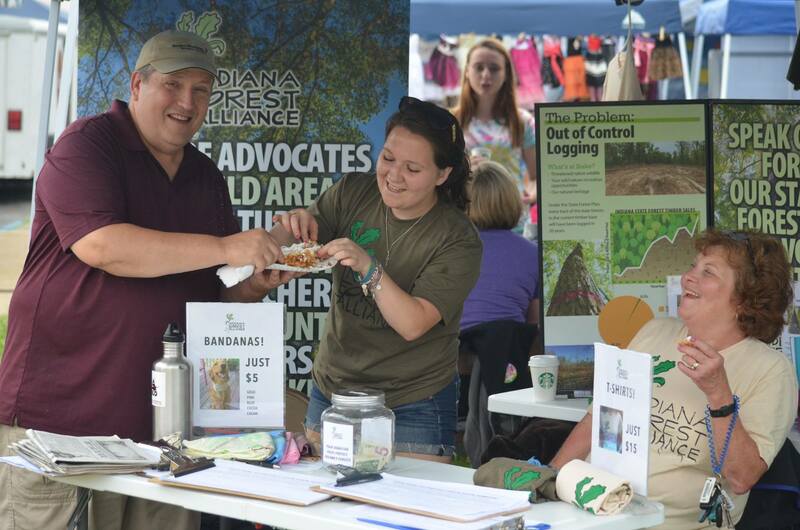 It took more than 50 individuals to coordinate, setup, staff, and clean-up this year’s event. Volunteers received a lot of feedback from people at the event and even more afterward, all of which expressed gratitude for a fun and family-friendly afternoon at the courthouse, despite the rain. 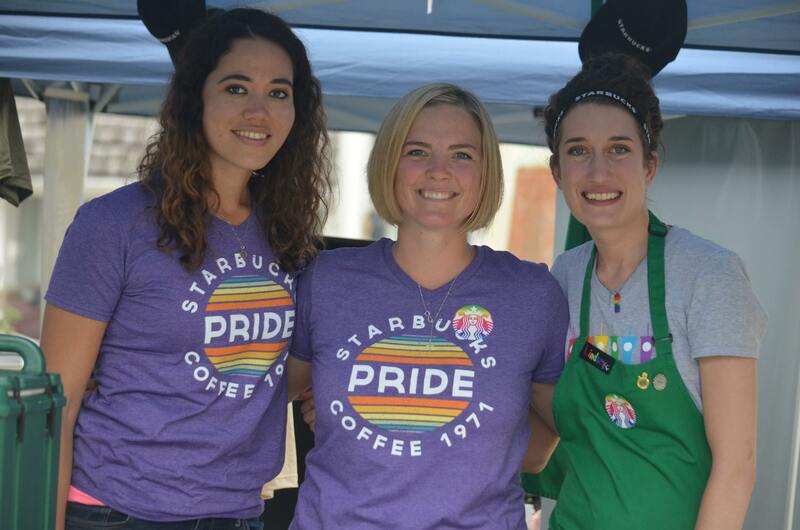 People continue to recognize the uniqueness of what Spencer Pride is – a family-friendly rural LGBTQI pride event where ALL ARE WELCOME. For ten years the event has served to dispel misperceptions of this rural community and organizers hope to do so for many more years to come. They ask that you help them continue to spread the word about Spencer Pride and their new CommUnity Center opening in the fall. The 2017 Spencer Pride Festival will be held on June 3, 2017. For more information about Spencer Pride, its events, and the CommUnity Center, please visit SpencerPride.org or find Spencer Pride on Facebook.